Do you have loved ones who can't (or shouldn't) eat cake because of health issues or dietary restrictions? Yet you want to make something cake like to celebrate a birthday or other special occasion? Or maybe you want to create a memorable special occasion "cake" that will surprise and delight your guests. How about a beautiful watermelon cake? My first watermelon cakes were a big hit! My First Watermelon Birthday Cake made for a loved one who couldn’t eat cake because of dietary restrictions. You may have already heard my story about how came up with the idea for my first watermelon cake. In a nutshell, we had invited a loved one over for dinner to celebrate her birthday. She had recently learned that she had some cancer. In an effort to regain her health, she had immediately started a special diet that did not include cake. She could eat very few foods but she could eat fruit. I pondered what kind of birthday cake – like dessert I could make with fruit and came up with an idea. I created a simple watermelon cake. Everyone got a kick out of it. It made for a sweet refreshing dessert without frosting, refined sugar, butter, food coloring and other unwanted ingredients.We lit candles, sliced it, served it, and ate it like cake. Everyone loved it. My loved one felt honored. She got to eat her “cake” instead of feeling left out and deprived. She took photos and showed them to new many friends when she introduced me to them over the next few months. The success of that first cake motivated me to look around for more fruit ideas and that is when I discovered the art of fruit and vegetable carving. After the success of that first watermelon cake, I came up with a few other watermelon cakes ideas. The next watermelon cake that I made was for my daughter-in-law who is a marathon runner. She doesn’t eat cake and other sugary desserts when training for a marathon so on her birthday, I made another style of watermelon cake with carved roses on top. Watermelon cake for daughter-in-law’s birthday. Monique blowing out her candles in the restaurant where we celebrated her birthday. What a buzz it created in the restaurant where we celebrated her birthday! Our waiter asked about the cake, the people at the tables next to us, admired it. A curious waitress from another area of the restaurant came over to see it. She was all excited to connect me to high end caterers in the area who were friends of hers who would love to buy cakes like that from me. Later when we lit the candles, that same waitress rushed over and asked if she could show our watermelon cake to her customers in another sections of the restaurant before we cut it up. All the attention that this watermelon cake got was quite amazing! But best of all, my daughter-in-law was able to enjoy her cake without ruining her runner’s diet and she felt special because I had taken the time to make this cake for her. All in all, it was another success. 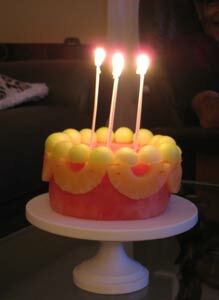 Now, you can create these beautiful and attention getting watermelon cakes for your loved ones. I will show you exactly how, step-by-step. Here are the watermelon cakes that you will learn in this 2 DVD set. 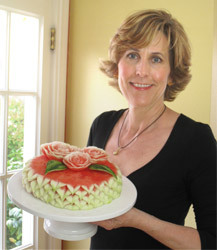 The second watermelon cake lesson shows how to carve a HAPPY BIRTHDAY Cake with scalloped edges and carved swags on the sides – this lesson is 50 minutes with detailed step-by-step instructions showing you exactly how to create it and how to avoid some common mistakes.And this cake can be used for any other special occasion by simply changing the words on top. This beautiful and intricate looking watermelon cake inspired by Thai style melon carving techniques features leaf like petals on the sides and is topped with carved watermelon roses and leaves. This detailed step-by-step lesson is 71 minutes.Not only will you learn to carve this cake, but you will see several variations of display ideas that will add drama to any buffet display or “cake” table. You may think that these watermelon cakes look too difficult to do. But once you are show exactly how make them step-by-step, you will find that they are easier than they look. In fact, the intricate looking leaf petal watermelon cake only requires 3 basic carving skills. You’ll see. Here is what a few students have written to me in emails about my fruit and vegetable carving lessons. “Good morning Nita,I have enjoyed this lesson very much , At the moment being summer in Europe, there is plenty of water melon. And family and friends do think I have special hands. Your lessons are my secret. “Hi Nita you made it so easy for me to carve the turnips and beets flowers. Before your video I thought it was impossible for me to do the flowers, but with your video I was able to do few of them. “Hi Nita: You are the best. 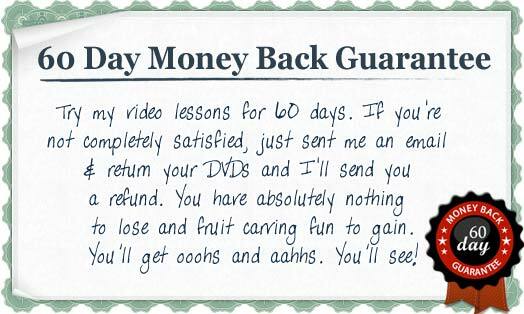 I have your free video, your 101 course and really enjoy all the short tip e-mails you send. Today I went all out and carved several things from a variety of your lessons, and everything, well almost everything turned out great. I find your directions very easy to follow and love it when you tell me it’s okay if the petals fall off my radish flowers and it’s okay if my rose petals in my watermelon are little wide. There are none of my friends that would notice, and I’m not telling. Thank you for all your great info. I won’t miss a chance to say you a big thank you for providing such fantastic lessons. They are so informative and easy to follow. “I am so impressed with your video lessons. I just made my first lotus flower from a radish. I offered a gentleman $50.00 an hour to teach me carving techniques and he would not accept. I am so grateful that he didn’t, because your videos are reasonable and I stop them as I work on my exercise. I am learning so much, and accomplishing amazing results. Thank you for giving me the opportunity to further my desire for carving fruits and vegetables with expert results. I look forward to your other videos. Let me introduce myself. I’m a 57 year old school board caretaker. I do a lot art type things( I oil paint, woodcarver, certified ceramics teacher to name a few). I have worked in the food industry. I got in to food art a few years ago. I picked up some decorating stuff over the years. I found your site on the internet one night. I was hooked, I love your videos because they are easy to follow and understand, they have helped me improve my skill level. I am looking forward to learning more from you and happy to call you my teacher. Just wanted to send you a picture of my first watermelon carving. Not perfect but did turn out nice and everyone was very impressed. Thank you for making your easy to follow instructions and videos. You truly can get great results right away!!! “I do have to tell you that you have renewed my excitement and love of carving. I had searched for so long for a step by step video for so long and could not find one. Then I stumble across your website and it is awesome. I love the fact that the camera zooms in on what you are doing and that you repeat what you are showing several times. Thank you Nita for making carving exciting and fun. I Love your style of teaching. All the three videos are very informative. Thanks Nita you are a great teacher. My fruit and veggie appetizers display turned out awesome. No one could believe it was my first one. I have done smaller fruit bouquets but nothing on this scale. The watermelon and Radish bouquets were the favorite. It was a big hit at the wedding in my back yard. Thank you very much for all the details…. I cant express in words how thrilled I am that I got your contact… Its indeed a great privilege to be associated with you… I am just amazed at all the beautiful work you do… the carvings are just wonderful, thanks for releasing all the 11 videos I have watched all of them.. first I need to grasp then i will start practising… i cant express in words how thrilled I am… when i practice, I will send you the photos of my work…. i was up until 1.00 a.m yesterday watching the videos… the instructions are so clear and its very easy to follow..
“I love your products and will be ordering more! You can get started right now with the satisfaction of creating beautiful watermelon cakes that will surprise and delight your friends, family and guests. To help you get started right away, when you order you will also get online access to your lessons. That way you can get start carving before your DVDs arrive. 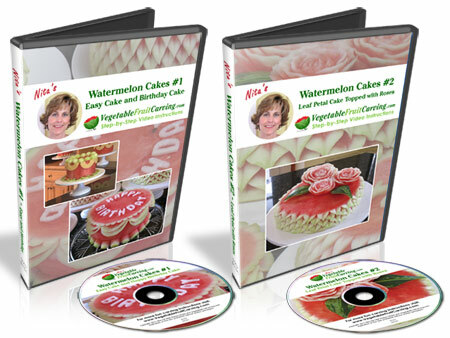 If you don’t already own the tools used in these watermelon cakes lessons, you will be able to add them to your cart after you click the button above. 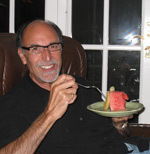 When you create your own watermelon cakes, send me some photos. I’d love to see them.